The genus Arhopala is one of the most challenging to identify and distinguish the look-alike species in the group, and definitely not easy to identify from field shots. 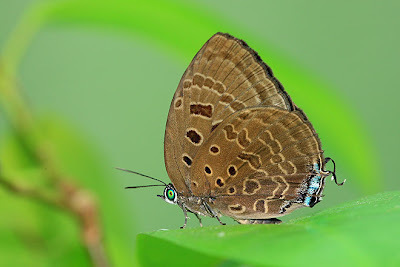 However, ButterflyCircle is pleased to announce the re-discovery of the Sylhet Oakblue (Arhopala silhetensis adorea) and added it as species #282 in the Singapore Butterfly Checklist. It started when ButterflyCircle member Sunny Chir spotted a medium-sized Arhopala fluttering amongst some low bushes in the shady forest along a jungle trail in the Central Catchment Area. Having earlier spotted the Green Oakblue in the same location, he thought that it was the female of the Green Oakblue that he shot. Another ButterflyCircle member, Horace Tan, who later went to the same location, was fortunate enough to spot a female of this species ovipositing on its host plant. Having been able to document the entire life history of this species earlier and comparing the early stages, it was found that this Arhopala was not the Green Oakblue (see Life History of Green Oakblue). 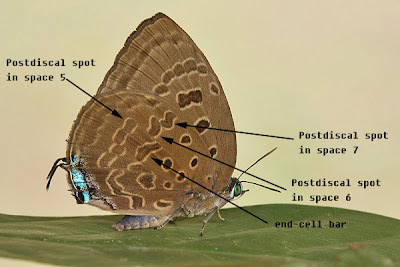 The search for the identity of this species then went overseas, and ButterflyCircle member Keith Wolfe of the USA referred us to Prof Konrad Fiedler, a German expert in the Lycaenidae family of butterflies for help. Another ButterflyCircle member, Leslie Day, a resident of Koh Samui in Thailand, also lent his experience and time to help us identify this unknown Arhopala. 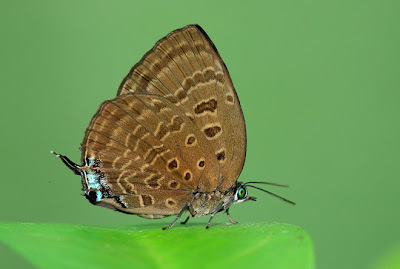 Having studied and compared the life history of this Arhopala species, and the key physical characteristics of the adult butterflies that were bred, it is now confirmed that this species is the Sylhet Oakblue (Arhopala silhetensis adorea). The full life history of this hitherto unrecorded species will be published shortly in this blog by Horace Tan. Well done to Sunny and Horace for their sleuthing skills and patience in helping us re-discover this species which was recorded in the early authors' checklists of Butterflies of Singapore. We now have 282 species on our Little Red Dot, and more to come soon!